First of all, Happy 8th Anniversary to What's On Your Workdesk Wednesday! This is week 416 that this fun weekly blog get together has been taking place. Thanks, Julia of the Stamping Ground for bringing so many together in fun and friendships! My desk is very busy as I prepare for swaps for our upcoming Fun Stampers Journey 3rd annual Convention, prep for a class on Friday, and more. So much happening! But I got the card kits done and today is the cut off for registering. 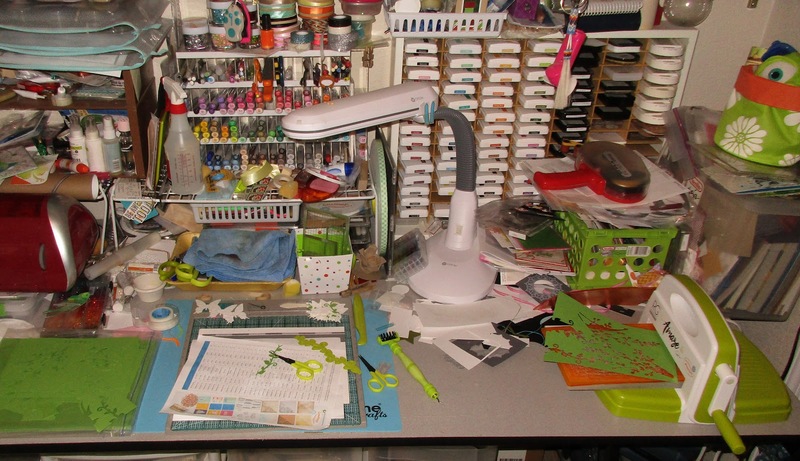 I have the first of a few "itty bittys" (our version of card candy or embellishments), and got my desk a bit more tidy since this picture was taken yesterday. This card has no stamping but all die cuts. 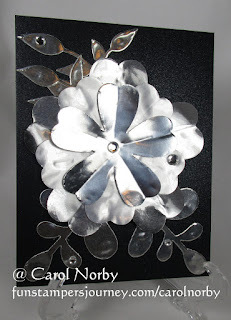 I save the aluminum seal from our coffee cans and used a variety of dies to cut them into the flower and leaves. A few rhinestones for more bling. I mounted the flower on a piece of pearled black paper. It's very difficult to photo this shiny card but it does just jump out at you. I'll be finishing this into a birthday card for my dad's wife's birthday tomorrow. So please head over to the Stamping Ground and check out the many desks and crafters taking part in this hop. I'll be working on my trades and swaps all day as convention is in 2 weeks!!! Hi Carol. happy 8th WOYWW anniversary. What a card! It must look really lovely in real life! Glad you seem to have sorted out the problems with "visits". Happy 8th Anniversary! I love the desk and your fab card. What a great way to recycle/repurpose! It looks like I'm your swapee, and I've emailed you my address! Have a great week. 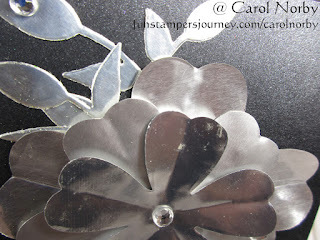 What a clever and pretty way to reuse those aluminum seals! Very nicely done. Happy 8th! Wow - great recycling! The card looks fab! Very nice card! Bet it really pops in person. You're the person below me so I'm sending you an ATC. Please email me with your address at Ipswich2 at aol dot com (capital i at the beginning). Goodness me but I love that metallic card - it is gorgeous! That's the one I'd buy for a special friend. Clever you recycling like that. Happy 8th Birthday for WOYWW. Great looking desk. I LOVE your desk and your Cricuit. I'm in awe. I also like the card. I buy coffee beans, so I don't have seals, but I have used the top of my peanut butter, which is also silver. However, I have never made anything as majestic as your card. Sorry I'm late in visiting. I had an appointment today, so had to be away from the computer. Happy 8th Anniversary from # 1. I love your card, what a great way of using things you would normally throw away. I keep no end of stuff but never use it and end of having to have a clear out before I disappear under things that might get used one day, lol. Hi Carol, Loving the card with the silver flower. It's not easy photographing reflective things. Love that aluminium look, can totally see how great a diecut card it makes! oh gawd, well done on getting all the kits done...it's a relief I'm sure. And I really am impressed that you're using bits o bits. And I love the green bag with the big daisies on it, how cheerful a way to carry your tools.